For over 20 years, Krettek manufactures advanced centrifuges for various applications of mechanical separation technology. The innovative centrifuges in the area of classifying includes all performance-classes, from laboratory up to highly industrialized production standard. Vertical or horizontal basket position? Inverting filter – the wrong concept ? Please feel free to contact us for further questions, or if you wish a individual recommendation fitting for your usage and products. The overflow process is one of the classical process of the centrifuge technology. In the past it has been mainly used for the solid/liquid separation with unperforated rotors. But it is also used in combination with filtration processes. 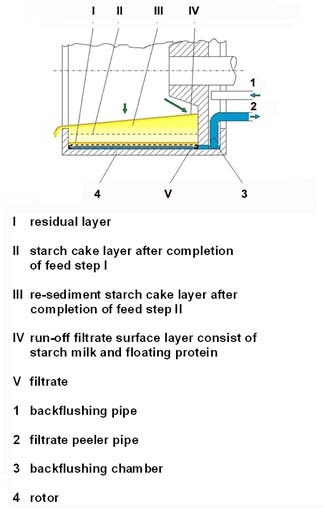 Layers of cake formationHere especially for the production of corn and wheat starch. 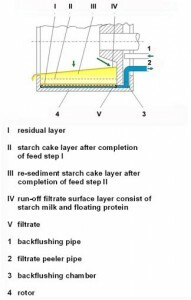 So it will be used for the separation of the protein which is floating on the cake. Furthermore it is only sporadically used, what from our point of view shouldn’t be kept. This method can be used as standard with a horizontal positioned Krettek backflushing rotor without structural modifications. The requirements for this are given with the separate way for the filtrate (filtrate peeler device in the area of the backflushing chamber) as well as with a discharge for the liquid flow, which is overflowing the edge ring (spraying liquid outlet of the housing). A vertical peeler centrifuge doesn’t has such an equipment in combination. The flexibility features of this overflow process are distinctive. So filtration and overflow process can run parallel, as e.g. described before for the starch industry. Also essential increases in performance are possible at the processing of slurries with reduced filtration properties, here also in combination with large amount of liquids. Significant successes also can be achieved by a defined classifying effect. For example, this is the case, when solids with a defined particle distribution have to be produced, e.g. the separation of ultra-fine material. Also the separation of floating impurities is useful such as slime or gel-like components, which can influence the filtration properties on a considerable scale and will be realized for example on a large scale for the dewatering of FGD-gypsum. Please feel free to contact us for any further questions or information.